Bacon T-shirt: Wear your pork love proudly! This Bacon T-shirt professes your extreme love of the worlds favorite meat. Our Bacon T-shirt design features the rich and beautiful look of real bacon as it spells out the word everybody wants to hear in glorious sporty lettering. 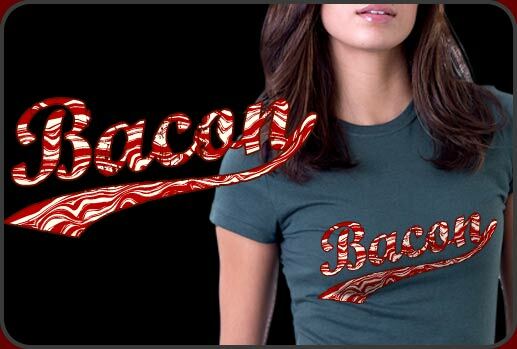 The distressed effect of the typography adds to the strangely hypnotic appeal of this bacon tee design. Loads of character and humor is assumed by the wearer of this glorious shirt. We have our bacon t-shirt available in every imaginable size and color for men, women and children. The bacon design looks extra nice on our dark color or black shirts, if that's the way you roll. For real bacon fans we have a few awesome gift items. We even used this bacon t-shirt design to create a gorgeous poster!